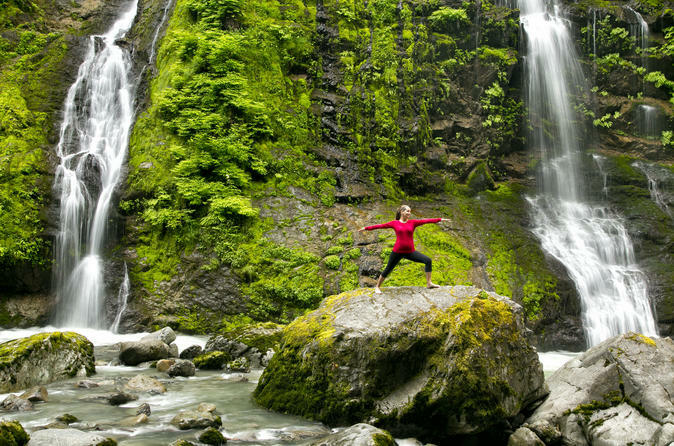 Experience the joy and relaxation of Washington's wonders firsthand with a Yoga In The Wild tour in the beautiful North Cascades. Combining invigorating and restorative yoga practices with exciting canyoneering adventure provides an unforgettable, once-in-a-lifetime experience. Take a break from the daily barrage of information and discover yourself anew at one of the most beautiful, serene destinations in America. Get the chance to explore spectacular and hidden local destinations. See spectacular scenery, along with a unique variety of temperate plants and wildlife. Your adventure begins with a warm welcome from your guide who will provide an overview of the area's fascinating history, safety information and an overview of the day’s yoga and adventure itinerary. Next, we will pack our bags for the day and depart for an adventure tour of the surrounding glacial landscape. We will pass through a vast and extraordinary glacial-carved landscape with sweeping vistas, natural wonders and spectacular alpine landforms unparalleled in their beauty and intrigue. Upon arrival at our awe-inspiring outdoor classroom, we will enjoy yoga and meditation practice amidst a beautiful and transformative landscape. Cascadia Country Yoga is truly and unforgettable and transformative experience suitable for all ages and practice levels. Lunches, snacks and park entrance fees will be provided on this excursion.